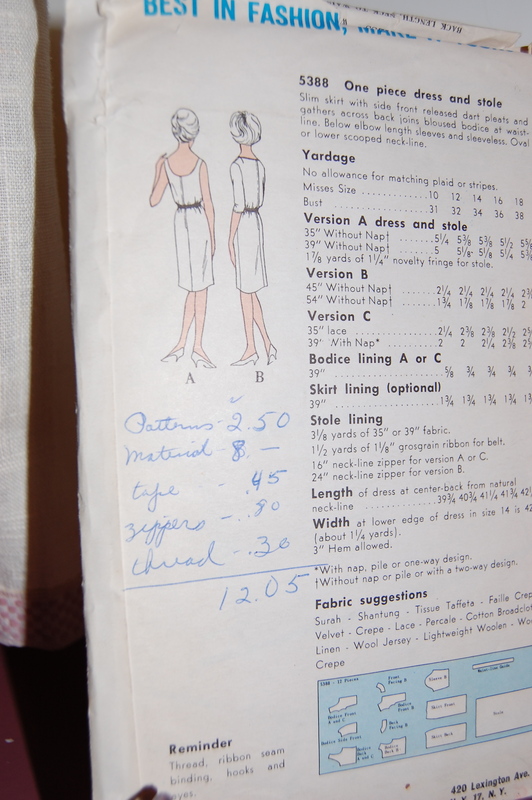 Many vintage patterns have a visible stamp on them which tells the name of the store where it was originally purchased. 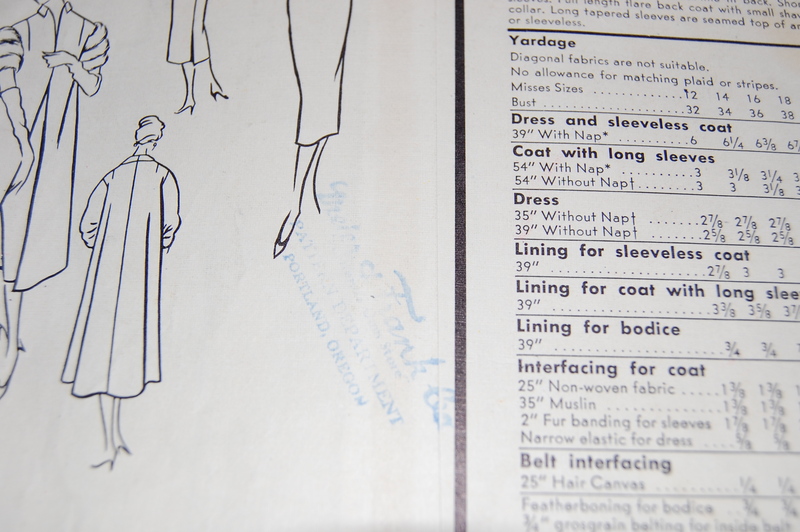 (Those of us who sew know that patterns, once purchased, are non-returnable – and it seems it was ever so…) Sometimes the stamp also lists the location of the store, but not always. Either way, that stamp is a visible clue to the pattern’s past life. In the upper left hand corner, you can see the stamp for "Fashion Fabric Center" in Albuquerque, New Mexico. This pattern is from the early '70s. If you look closely, you can see the stamp on this envelope which tells you it was purchased from Meier & Frank Pattern Department, Portland, Oregon. 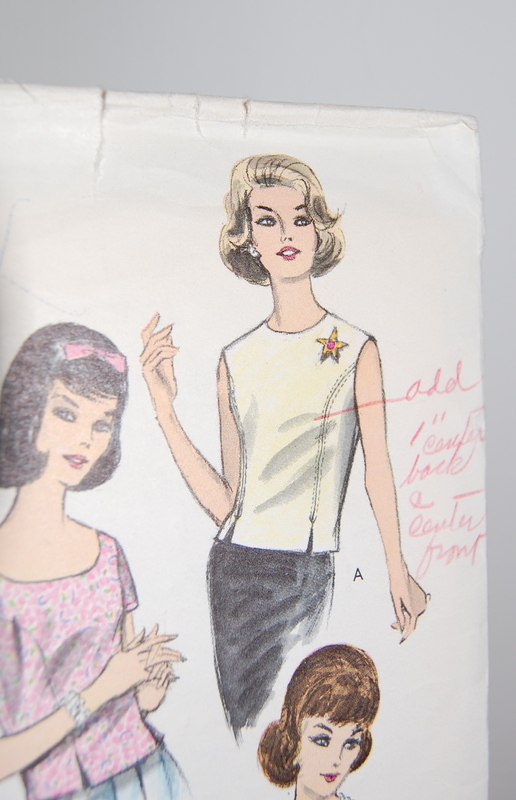 This pattern is from the 1950s. I can’t help but visualize a well-put-together woman perched on a stool at the pattern counter of the mentioned store, thoughtfully flipping through the pages of the Vogue Pattern catalogue, and finally settling on this one pattern. I wonder what occasion, if any, she was making it for? Was she, like I was in the ‘60s and ‘70s, agonizing a bit over spending 75 cents or $1 or $3 or $5 for just a pattern, and then loving it once the decision was made? Was she buying it to make it herself or in coordination with a dressmaker who would be the one to create it for her? What fabric and color was she intending for the pattern? 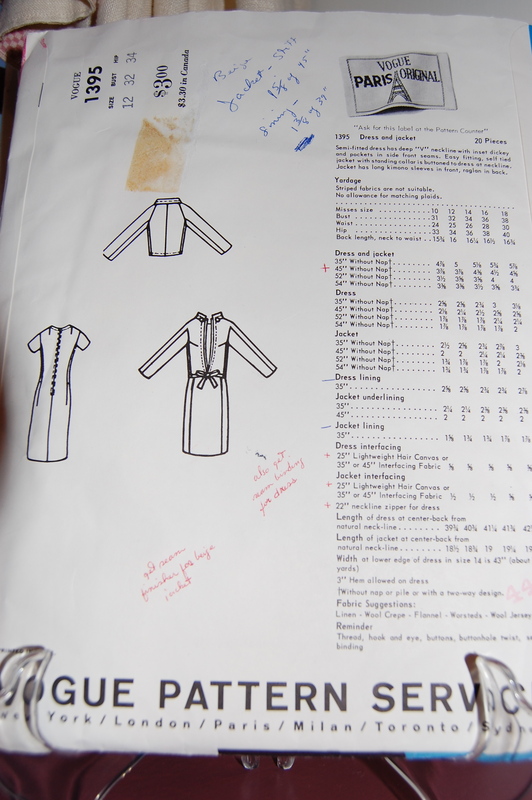 Or did she buy the pattern and then, for one reason or another, never make the intended garment? And then, every once in a while, there is a handwritten note or diagram on a pattern envelope. Fit seems to be an important focus. Kudos to those dressmakers who recorded their difficulties on the pattern envelope! I think this lady should have purchased a larger size! She needed to add 1" center front and center back! Beware! Poor fit in jacket! But I bet it was lovely in coral nonetheless. Check out this listing on Etsy to see a rather melancholy note about fit: “would have been best to have gotten the med. size.” I guess that pattern ran large! Choice of fabric and color (see above image) are also details which have been noted, sometimes multiple times on the same envelope. I think this pattern must have belonged to a professional dressmaker. She made it up in red and green wool for Audrey Dolan, with long gathered sleeves. It looks like she also made it in tan and in a print (Prt) with 3/4 sleeves. The pattern tissue is still in great condition, despite all that pinning and cutting! This pattern obviously belonged to a lady who was either a dressmaker, noting her expenses, or a home sewer who kept careful records for her household/clothing budget. This lady must have made this dress in coordination with another pattern. Both patterns together cost her $2.50. She was also buying multiple zippers, to the tune of 80 cents! Her big expenditure was fabric (material), which she lists at $8.00. And here is a pattern which Mrs. John Morton “Chgd” [Charged] Perhaps she did not have to be as careful with her expenditures! I think Mrs. John Morton was one stylish lady! 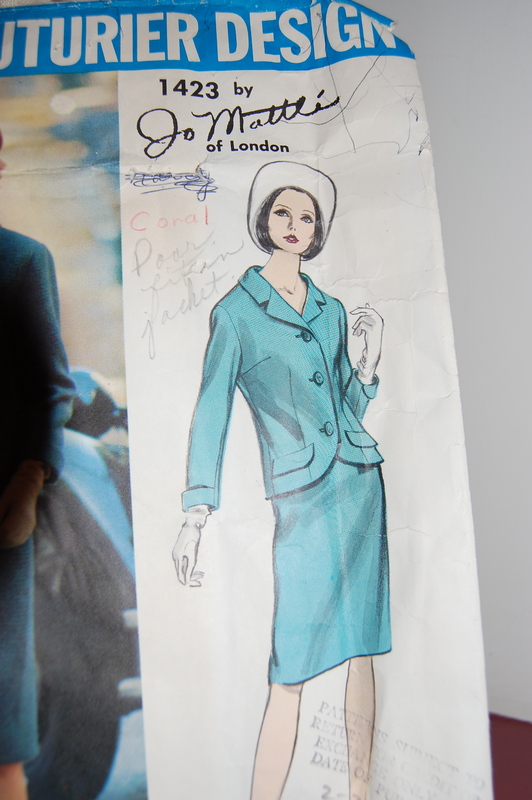 This next pattern is a study in contradictions: The owner has carefully noted some yardage requirements, written notes to remind herself to “get seam finisher for beige jacket” and “also get seam binding for dress”. 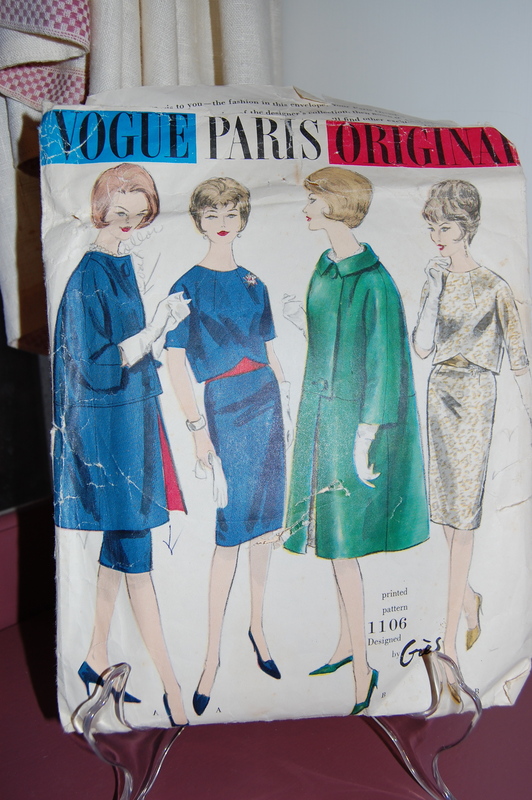 But the pattern came to me uncut, factory-folded and therefore unused, with its original Vogue label included. I wonder what prevented her from ever making this lovely jacket and dress? We know she intended to make the jacket in beige, but she doesn't tell us about her color choice for the dress! View A on the far left just did not suit this sewer. 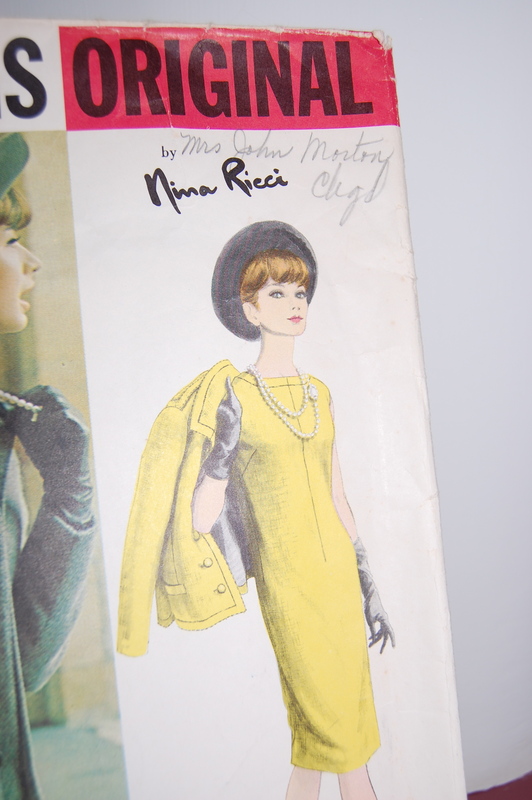 She wants to extend the length of the coat, and add the collar. What she is really saying is that she wants to make view B, but with top-stitching! 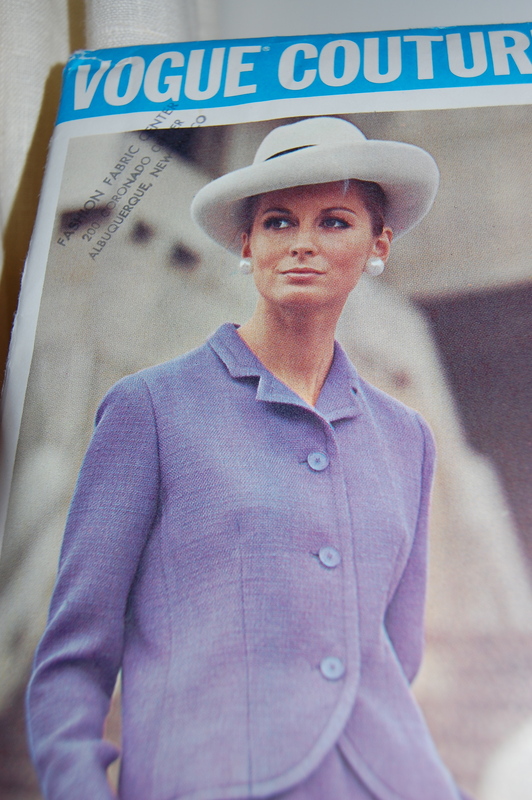 It seems lengthening coats was a popular thing to do! 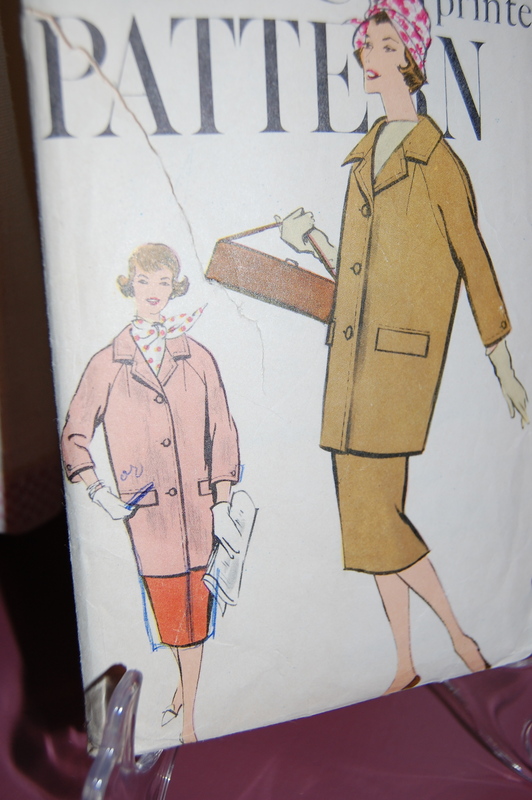 This lady drew the longer version of the coat (on the left) and was still deciding on making the pockets "slash" pockets instead of flap pockets! Finally, sometimes all that is on a pattern envelope is a name – a simple notation, which quietly transcends the years! Look below the figure in red and blue for the name written in pencil. Here is a close-up of the signature. 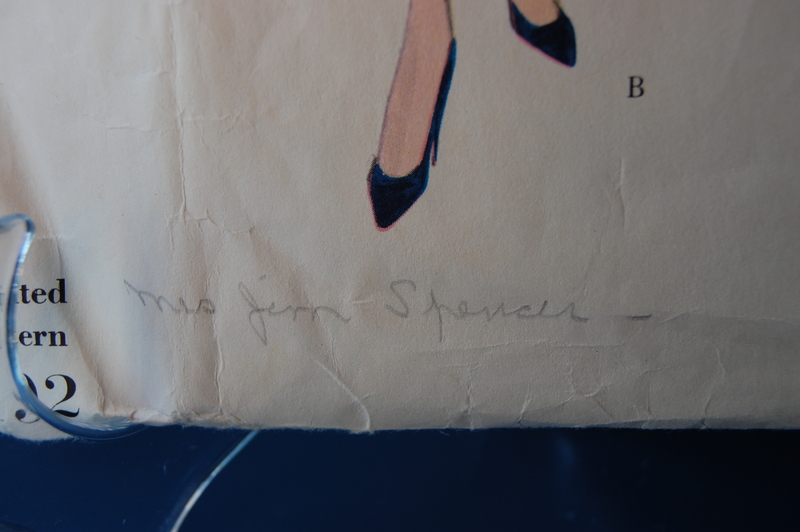 This pattern belonged to Mrs. Jim Spencer. Mrs. Jim Spencer, I bet you looked fabulous in this suit! Wow – “multiple” zippers for 80 cents?? Interesting that, even today, you can still get patterns for $1 if you wait for a sale. 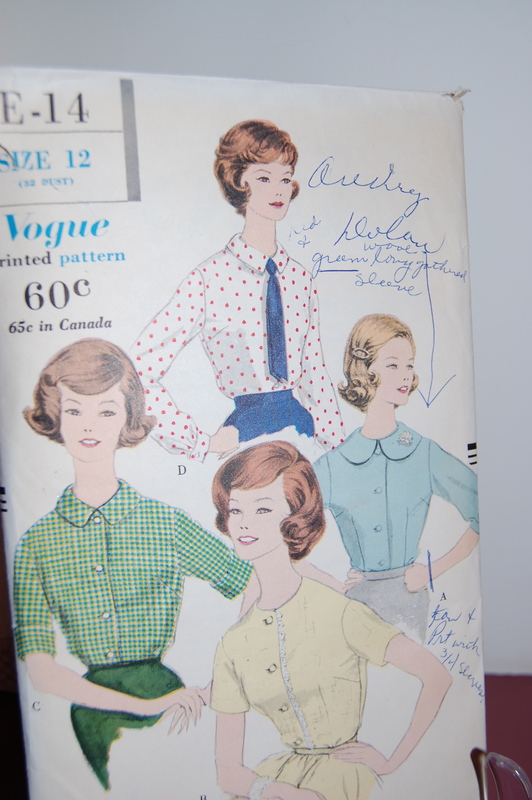 I love the artwork on vintage patterns. And I love that the women who owned them before you didn’t get stuck on the color of the sketch – they actually planned to make it completely different! I’ve always wondered if the artists doing these sketches on pattern envelopes had/have artistic license to choose the colors/prints/plaids for the designs or if they had/have to follow a scheme set by the designer(s)… I don’t buy a lot of new patterns, so I didn’t know that patterns are re-issued with different photos. Very interesting! I’m not sure how much say the artists have, but I’ve noticed (on at least the modern patterns) that a lot of times, I can often find the same print in real fabric or currently used to make something else that is off-the-rack. So apparently, they start with real textiles before they design or have someone else color the designs (like in animation). What fun it is to look at all these old styles. They hail from a time when I really did a lot of sewing for myself and it’s giving me the itch to do a bit for myself again -something I have done little of in the past few years. 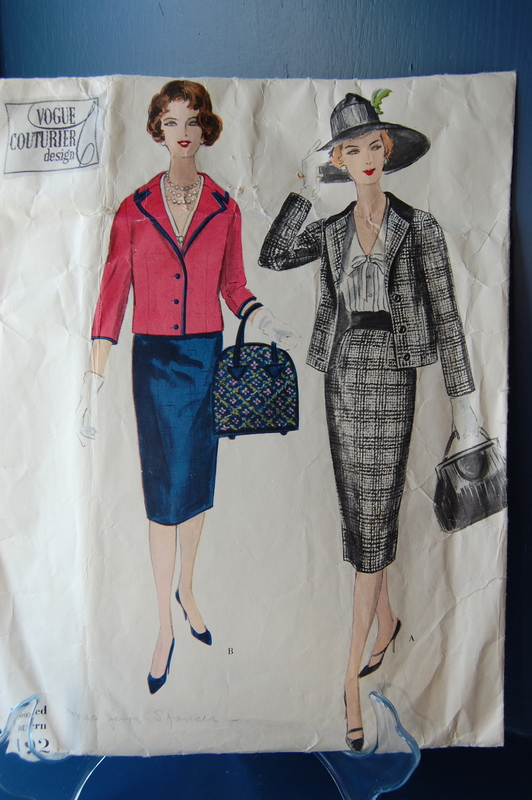 I’d love to make a pretty print cotton dress for summer-boat neck, cap sleeves, fitted waist and flared skirt. (Real Doris Day-ish!) I’ve got to start looking for such a pattern or something I can adapt to that look. I’ll keep you posted on my progress.